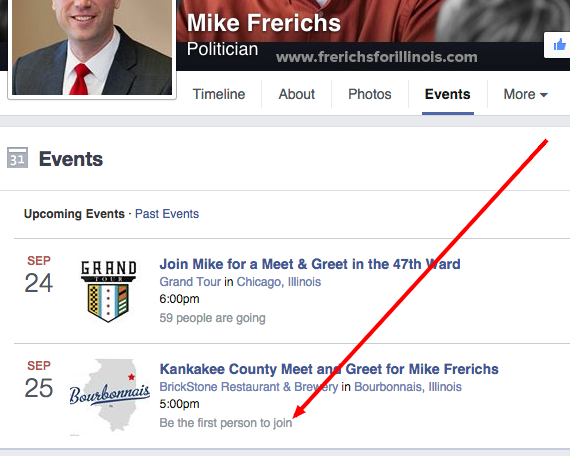 Treasurer Candidate Mike Frerichs: All Alone In Kankakee? In typical Mike Frerichs for Treasurer-fashion, Tax Hike Mike's campaign has breathlessly posted a bunch of 'events' on their Facebook wall. We here at the Truth Team have to believe that Mike and his team don't actually think too much about what they post, they just flail away. And..that's good news for us, because it gives us a bunch of fodder. The latest example is the event listing they have for tomorrow down in Kankakee. It has been up on his wall for weeks, and unfortunately...no one - and we mean no one is going. It is a 'free' event, and still they can't get people to come out to support Mike Frerichs' sinking campaign? He's even enlisted folks like Lisa Dugan and Democrat County Chairman John Willard to round up some attendees. And...still nobody. Talk about an enthusiasm gap. At least he can point at Sheila Simon as being further down the line from him in terms of support? That's something?